The new Canon PowerShot G1 X Mark III offers dramatic improvements from the series’ previous flagship, the PowerShot G1X Mark II, headlined by a larger, 24.3-megapixel APS-C CMOS sensor, resulting in fantastic image quality in both stills and video. This dramatic sensor upgrade pairs with a wide-angle 24-72mm (3x zoom) lens with Optical Image Stabilization featuring a wide f/2.8-5.6 aperture to allow for maximum brightness and increased sharpness in images and an ISO range of 100-25,600. This provides users with the versatility to shoot in low-light scenarios like a dimly lit restaurant which can frame subjects with beautiful background blur. Instantly connect to a smart device via built-in Wi-Fi, NFC or Bluetooth to facilitate easy sharing with friends and family or utilize the Camera Connect app to shoot remotely. The Canon PowerShot G1 X Mark III is scheduled to be available in November 2017 for an estimated retail price of $1,299.00. In addition the Canon Lens Hood LH-DC110, Waterproof Case WP-DC56 and Deluxe Leather Case PSC-6300 for the PowerShot G1 X Mark III will be available for an estimated retail price of $59.99, $499.99 and $99.99 respectively. 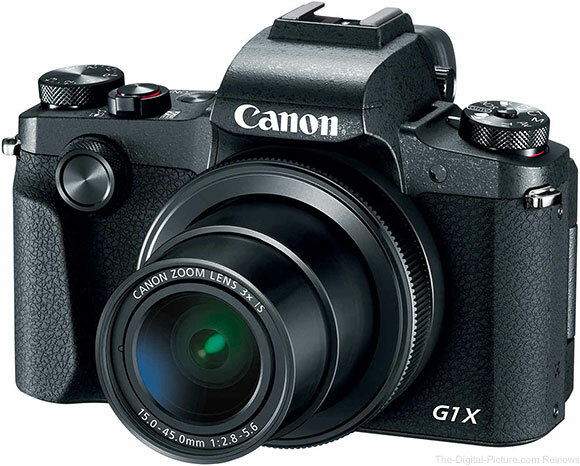 B&H has the Canon PowerShot G1 X Mark III available for preorder.